Tomorrow I go to the vet to pick up Little Half Pint’s ashes. Whenever I start thinking I can’t believe she’s gone, one look at the cage area that was once her home, in all its emptiness, tells me otherwise. As I was telling Tracey the other day, this is the damned thing about pets: not to sound morbid, but the moment you bring any pet into your home the clock starts ticking towards the time you’re going to end up having to make a difficult decision and help bring about their end. That’s just the way it is. Hopefully it’s a slow clock, but it’s still a clock, nonetheless. Some people just can’t handle the pressure of putting down a pet – it’s so emotionally hard for them that they can never bring themselves to take another into their house. Heck, I’ve been there: I was there when our two cats Rascal and Sparkle breathed their last. Was it painful? Absolutely, you bet. Was it beyond the most precious and intimate experience I’ll ever know? You bet. 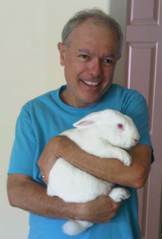 And when I go up to The Bunny Basics rabbit rescue in Scottsdale, I can’t help but look at those those beasties and see in their eyes that they don’t know who’s come before them, all they’re looking for is a good home with someone to love them. for who they are, now. You bring a pet into your life and there are lots of joyful times. But, like life itself, there’s no such thing as joy without sorrow – that’s just the way it is. Everything that is born has an end attached to it. At some point, after x number of years, the time comes when you have to say goodbye. And it’s one of – if not the – hardest and saddest thing you’ll ever do. But to me, the years of happiness, joy, and unconditional love they have given far outweighs the days (and perhaps hours) one spends making sure their lives come full circle so they know they’re not alone at the end. I hear ya there Doug. in my stomach when I had to put her down. It’s always a sad day to let a pet go. The thing about most pets, aside from the expiration date, is that you have to take an active role in most cases. They rarely just die in their sleep. Good pet owners struggle with the tough questions. Are we too early? Are we too late? Is cost or convenience a factor? Good pet owners always do the right thing. They’re all off the hook in my book. Your words are so very true and close to home. Not three months ago I had to make the extremely tough decision to put down my best friend after 11 amazing years together…the hardest thing I’ve ever had to do. At this point, I can’t even begin to imagine going through that again. But as often as I see his urn sitting there and think of how much I still miss my buddy, I also know that I miss him that much because he brought so much joy to my life, joy that I’m sure the next pup will bring as well… provided I’m strong enough to accept the responsibility again. @Rob: You hit it right on the nose… the active role in such a decision is brutal and those factors of cost vs convenience will gnaw at you forever. It wasn’t funny at the time, but looking back it was, in kind of a pathetic way. Our first cat Rascal had had a long happy life and towards her end she had contracted a tumor on the side of her face. I had told Tracey it was time to put her down, but because she was still eating Tracey just couldn’t pull the trigger. By the time we both agreed the time had come, it was really past time – she had lost a lot of weight and had trouble walking. You should have seen the look the vet gave us when we brought her in. We didn’t mean to wait that long, it just happened that way.